Kyphosus bigibbus Lacepede 1801, the Gray Sea Chub. Indo-Pacific; to the Hawaiian Islands. To 60 cm. overall length. Hawai'i image. Has shorter dorsal fin than K. cinerascens. Occurs in all yellow, white and koi varieties. This one in Hawaii. Gnathodon speciosus (Forsskal 1775), the Golden Trevally, what a beautiful fish! As a juvenile to adulthood this bold, golden splendor is a sight to behold… all shiny gold to silver bodied and finned, with an assortment of vertical black barring. My first memory of this fish is as a boy, snorkeling off of Southern Japan. A tiny yellow, almost-just-a-dot fish "leading" just before my mask… like a miniature pilot! (THE Pilotfish, Naucrates ductor is part of this family btw). 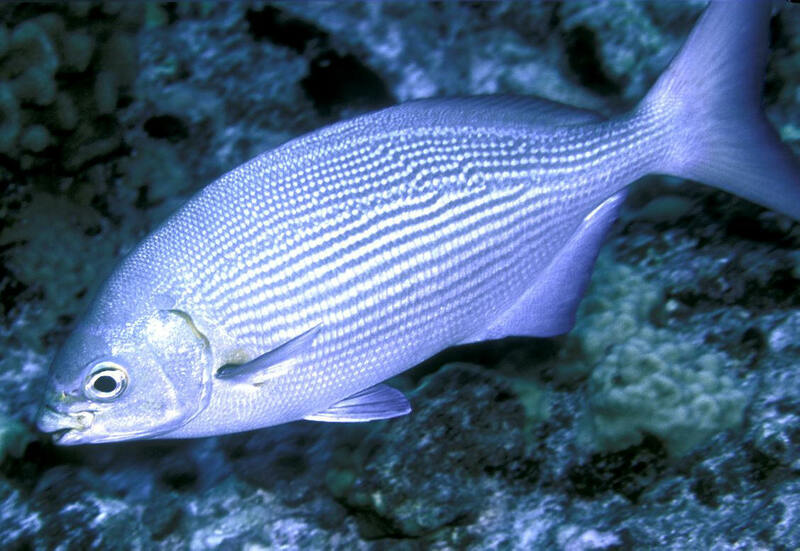 Small juveniles do associate with jellyfish, sharks and divers, likely for protection. A group here at Quality Marine, Whlse, LAX. Selene brevoortii (Gill 1863), is the Mexican Lookdown. 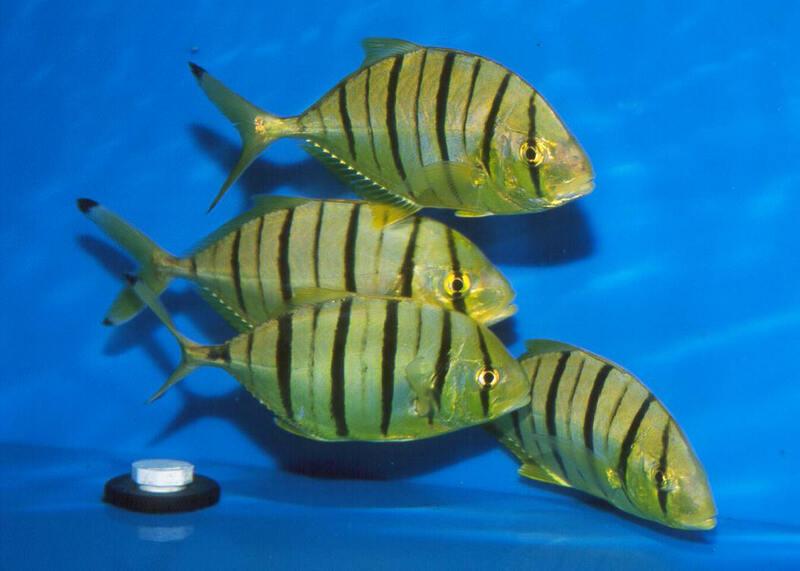 This and THE Lookdown, Selene vomer make their way into the trade (the latter through tropical West Atlantic collectors). This unusual looking (slightly tilted downward, looking at the bottom) fish does have two things going for it that most Jacks don't… It doesn't get that big (38 cm., about 15 inches long maximum… aquarium specimens smaller), and it's not that active (eating, eliminating, breathing, swimming) a species. At a LA whlsers. 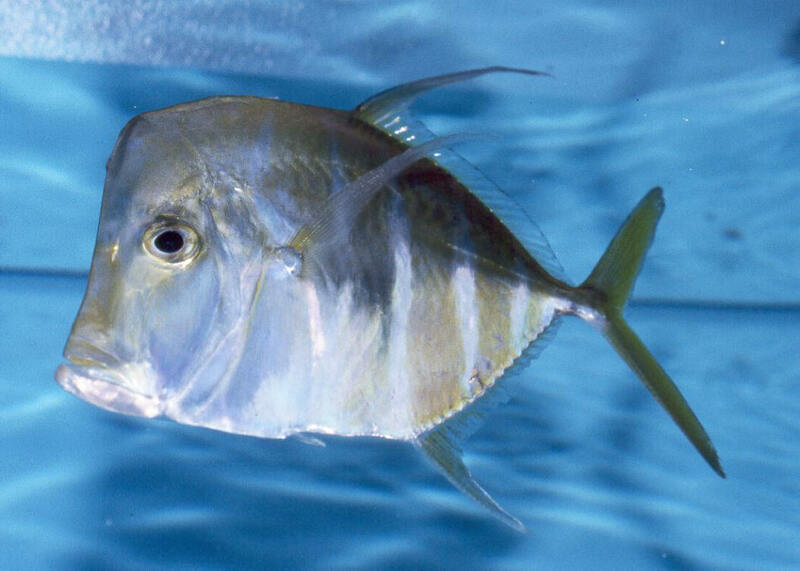 Alectis ciliaris (Bloch 1787), the African Pompano. Worldwide in tropical seas. To 130 cm. Here in the Lembeh Strait.